Welcome to B.A.S.E. Ballyboden Adult Social Education. Here at B.A.S.E. we offer an extensive range of adult education courses and classes in a relaxed and pleasant environment. Many students who take part in our classes come back to us year after year. We have a friendly voluntary committee who are there to greet you with a warm welcome. Our prices are very reasonable and we offer discounts to OAP’s and the Unemployed. B.A.S.E. 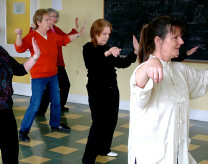 offers social classes such as Gardening, Pilates, Body Burn, Dancing, Yoga and Language classes. Most of our classes run in Whitechurch Youth & Community Centre – Monday to Friday mornings. We have a couple of evening classes too. Each course runs for 10 weeks and there are two terms (Winter/Spring and Autumn). We run a limited number of classes after Easter. Contact us on 01-4935953 9.30 am – 1.30 pm. B.A.S.E. began its involvement in Adult Education in 1991 and we began our classes in Whitechurch Library. In 2010 we moved our classes to the new Community Centre in Whitechurch Heights, newly built by South Dublin County Council. The Community Centre is a welcoming, warm, bright space with excellent facilities for classes. We avail of two rooms there and we also have use of the kitchen so that our participants can have tea or coffee. We do our best to accommodate everyone, however first come first served applies.